Title Card: On the high sea of heaven - The enemy! Count von Kellermann - famous German ace and leader of the Flying Circus. The rival leaders signal for attack. At ten thousand feet above the earth, the opposing squadrons hurl themselves into a 'dog fight'. Remains really well made and impressive!! An epic WWI movie that uses all the classic approaches to a war film and has a lot of great battle footage. It's a tale of rivalry over a girl, of fighting for country (and against the Germans), and of facing death. There are several scenes that make death really gruesome--blood spurting from a pilot's mouth, or a man crushed under a tank--that took me by surprise. I didn't know that such a mainstream American film would go there. 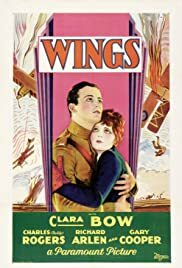 "Wings" is in a way exactly what American movies would look like thereafter--not just war movies, but all of them. By that I don't mean directors studied this movie and it was the inspiration from here on. 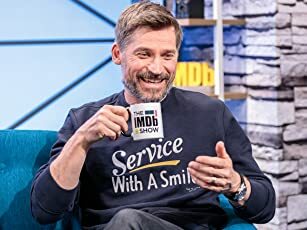 But just that the story line, the romance, and even the filming, adventurous but straight on, with more attention to characters and plot than visual effect, all of this would be how films would be made for decades. Including many more by the director, William Wellman, who is one of handful of truly expert but never quite daring and inventive directors of classic Hollywood. To back this up neatly, compare this film to the other film that jointly won Best Picture this year (the first year the Oscars were given, and the only year when the best picture category had two separate parts). That is Murnau's "Sunrise." Never mind which is better ("Sunrise," easily by most accounts). Notice how this film is utterly conservative and "conventional" in its approach to the art of making movies. It's superbly well done, but well within the rules of the time. Yes, there are moments of inspiration, including some double-exposed stock where a scene takes play in the sky over another scene on the ground. But "Sunrise" shows the lyrical art of the camera, and of editing, and of a less literal kind of storytelling. "Wings" is probably much easier to watch for most people--that's the idea. But "Sunrise" is far more engaging and complex, begging you to watch it twice. I doubt anyone needs to see "Wings" a second time. But then, I have to admit the acting makes more sense in this film. The naturalism of the three leads helps you get emotionally involved. The most famous by far is the woman, Paramount's biggest star, Clara Bow. She doesn't get a huge role (the men do the fighting and flying) but at least when she's there she's a treat. 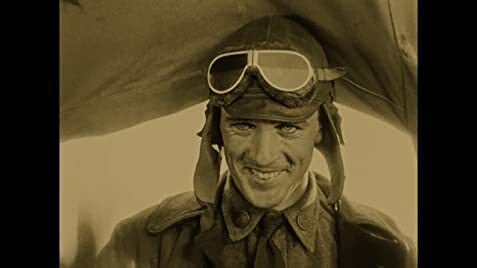 The flying is actually done by the actors, and many of the people involved were veterans (including Wellman, who was a WWI pilot himself). It's pretty exciting to find this so exciting all these years later. Give it a look. It's been restored really well (there's even a new Blu-Ray release). And it looks great. Don't expect anything new from the story or the filmmaking, but just expect a really well made high drama affair.